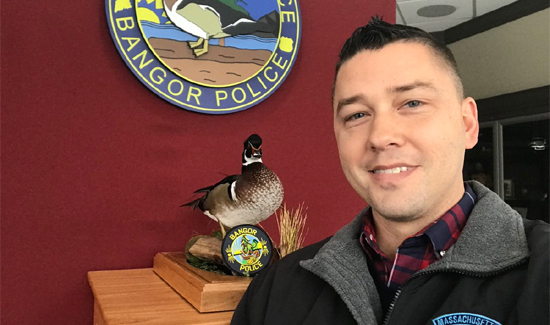 Lt. Tom Cotton runs the Bangor (ME) Police Department Facebook page. He’s nothing short of a social media genius. How else do you explain 260,000-plus followers on Facebook page for a police department in a small Maine city with a population of just over 30,000? What Cotton seems to understand that so many on social media do not is that a good local law enforcement Facebook page is about finding the right balance. It needs to be funny, but the right kind of funny. It also needs to be useful for citizens that have questions about public safety. Cotton gives advice that’s simple and easy to understand. When people ask, “How do I avoid dealing with police,” Cotton says just do what Mom said when we were little. 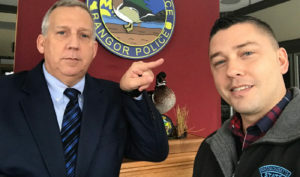 Lt. Tom Cotton, left, poses for a photo with a Massachusetts police officer in front of the shrine fro the Duck of Justice. But it’s not just sage advice and good copy (writing) that makes the page stand out. Cotton (along with his trusty sidekick The Duck of Justice) is just a really funny guy. And Lt. Cotton has advice for other folks charged with keeping stuff light and above board on social media. Frequently these pages are a disaster because they’re loaded with posts about “idiot civilians” and hopes and prayers for sick stuff like hoping for an earthquake that would kill people from California. Cotton’s no chest-thumping glory hound and his humility and humble nature help make the page what it is.